Every time I find a pediatrician I really like, they tend to disappear. Well, not actually disappear -- but they move to different states, or change practices that aren't covered under our insurance, or switch to the opposite side of the valley. I was very happy with our most recent pediatrician, but unfortunately he was traveling too far from home and found a job closer to his house. I'm not up for traveling 150 miles round trip for a pediatrician (especially when I have 3 kids) so I didn't follow him. The main pediatrician at our current practice I like, but she was booked months out for well-child visits this month. So, we met the new pediatrician for Nate & Lydia's well check visits. (Yes, they're months late. But Nate was sick for his well-check in May and we've been busy.) She was young, but I didn't hold that against her. She asked the kids some questions, I shared with her about Nate's stutter and how he's receiving therapy, we talked about the allergy testing the previous pediatrician had ordered. And then she began to annoy me. She asked about school, and we shared that we had homeschooled, but this year the boys would be attending our local school. She said "Oh, that's good. You'll have friends now." I jumped in and said "They have plenty of friends now. 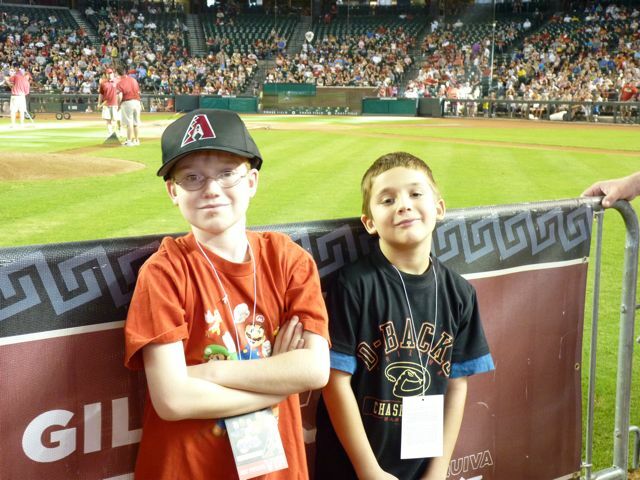 They play a number of different sports, attend religious ed at our church and have made close friends with other homeschooled kids in our circle." She just nodded and asked Nate if he was excited. He said "No, I like learning at home." and her response? "Well, you'll have lunch and recess at school!! That'll be great!" Um, really? He didn't have lunch at home? And the chance to play outdoors pretty much whenever he wanted to? I think they have a 15 minute recess at the school they'll attend. I understand that homeschooling was probably foreign to her (although it shouldn't be, as I know a few of the families that go there are homeschoolers) but to tell a child who has been schooled at home for years that he should get excited about lunch? and recess? seemed ridiculous to me. I let it go, and we continued on with the appointment. Where she told me Nate had to be in a booster seat until he was 80 lbs. I said "Really? 80 lbs?? Is that a law?" And then she confessed she didn't really know. (FYI: It's not law in Arizona. There is no weight restriction in Arizona, but kids under the age of 5 need to be in a car seat / booster.) I said that he always wore a seat belt and sat in the back and we felt that was appropriate for an 8yo boy who weighed more than 60 lbs. I realized that I don't want a pediatrician who doesn't have children of their own and will do what I can to avoid making any future appointments with her. I also want one that actually listens to what I say. It got more annoying when I was told that Nate had not passed the eye exam. I was surprised, as we had recently had him tested and he had perfect vision. I know that vision can change quickly, though, so I planned to make an appointment for an eye check. Until Nate told me how the nurse never let him finish his sentences. She kept cutting him off and filled in words that he wasn't planning on saying. Instead of working with him and his stutter (which is documented in his record and also plainly obvious when you talk to him) she rushed through the exam and decided he couldn't see since he struggled with his speech. What do you look for in a doctor? Do you think I expect too much? We had an absolutely wonderful afternoon with some new friends and their children. 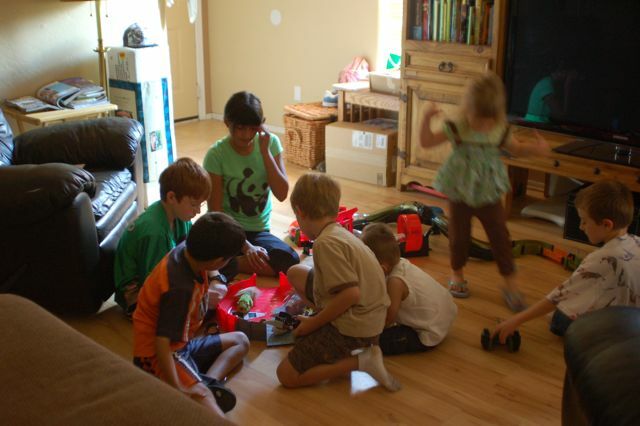 We invited them over to play with Kung Zhu pets . (You might remember last year when we had the chance to introduce Zhu Zhu pets to our friends. I was thrilled (and grateful) to be asked to throw another party by Mom Select.) My boys worked hard for a couple hours this morning putting all the tracks and pieces together, then 9 kids were here having a blast playing with the mechanical hamsters and a ton of their gear. These new Zhu Zhu pets -- the Kung Zhu pets -- are definitely geared to boys (although I'm sure there are plenty of girls who will think they are cool, like my Lydia!) They are split into a ninja group and a special forces military group -- complete with armor , tanks , weapons and battle arenas . Every single kid in attendance (ranging in age from 3 to 11) thought the pets were very cool and were excited at the chance to play with them. 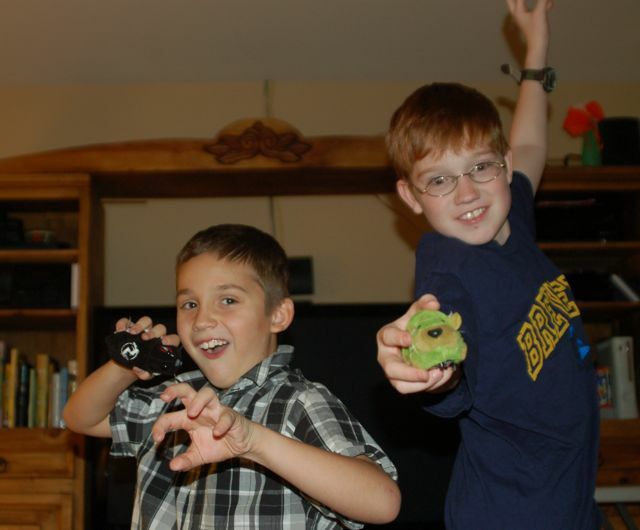 The squeals of excitement filled my house, and made it obvious that everyone had a great time. These definitely get a thumbs-up in our house. My only complaint is that the play sets are very large. We don't have the space to leave them set up, and it definitely takes time to put them together and take them apart again. I think the pets themselves are wonderful, though! If you had a big playroom (thinking of my cousin's house when we were kids and the entire basement was a playroom) then that wouldn't be an issue. After the noise of the party, Colin took the opportunity to show how the play sets fit together and worked with the pets. I took this picture as we were leaving the Arizona Science Center. I had a rare day free; Nate has been asking to visit since May; we chose to make the drive downtown yesterday. The kids all had a great time at the Science Center, and especially loved the planetarium show of Arizona night skies. Me? I'm going to confess something. It's stressful to keep an eye on three kids. Lydia is extremely independent and has no problem walking away from me. The boys are interested in different things, and are independent enough to read exhibits on their own, and don't really need to stay with me when we're in the same exhibit. But, it makes me nervous when I can't have my eyes on all three at the same time and the way the exhibits are set up it's difficult to be in the same area and be able to see everyone at once. My boys are great about coming when they hear me call, and I did my best to let them wander and look at things at their own pace / interest level -- but I was happy (relieved) to load them up in the car and head home. I believe (hope) I did a good job of covering my unease while we were there, but it made for a cranky night for me. I don't want them to approach situations with fear, and I want them to feel confident and not spend every moment at my side -- so I work very hard at controlling my anxiety and not sharing it with them. More than 4 hours of it, though, meant that I was worn out by evening and took it out on my dear husband. Thankfully, he's understanding, but I wish I didn't worry as I do. Our amazing "2010 Summer of Fun" continued with an afternoon that started with an Arizona Diamondbacks game and finished with a Wiggles concert! 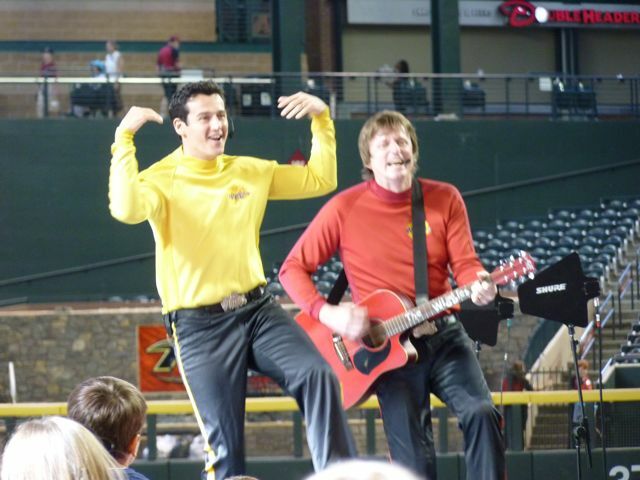 The Wiggles kicked off their US tour yesterday in Phoenix, AZ after the Diamondbacks game at Chase Field. We were lucky enough to attend thanks to Sprout TV. Not only did we receive tickets, but we received VIP tickets, which allowed us to watch the concert from the field! 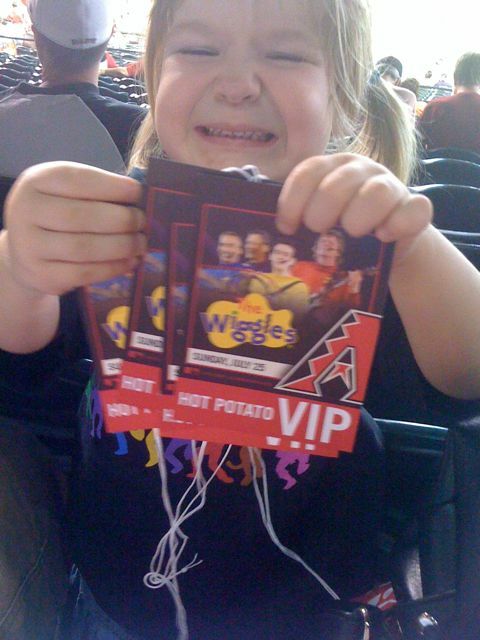 The boys were most happy about attending the Diamondbacks game, but Lydia was very good sitting through the game and waiting for The Wiggles. I think she's going to grow up loving sports! She's always game to watch her brothers play, and sits through professional games with no problem! After the game ended (we lost to the San Francisco Giants by one run), we headed down to the field. 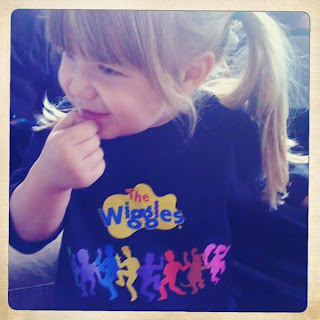 I took Colin to a Wiggles concert when he was 2 years old (so almost 8 years ago now!) because he absolutely adored the Wiggles. The group (with one new member since that time) still has the same amazing high energy and infectious laughs that I remember. We listened to The Wiggles so often that Bo & I remembered all the words to the songs they sang . Nate got into the fun of the concert, too, and was happily dancing and singing along with the crowd. Colin refused to acknowledge that it was fun, but stood around stoically until it was over. For the rest of us, however, it was great fun!! 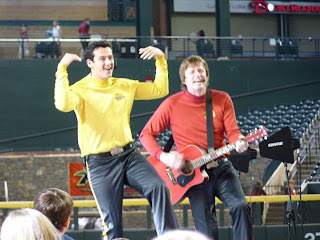 It brought back warm memories of when my boys were little and all the days we spent singing and dancing to the Wiggles. Lydia wanted to meet them all and shake their hands. Luckily, Murray came into the crowd close enough to us at one point so she was able to meet him. She was disappointed that she wasn't able to shake all their hands, but was pretty pleased with meeting Murray. 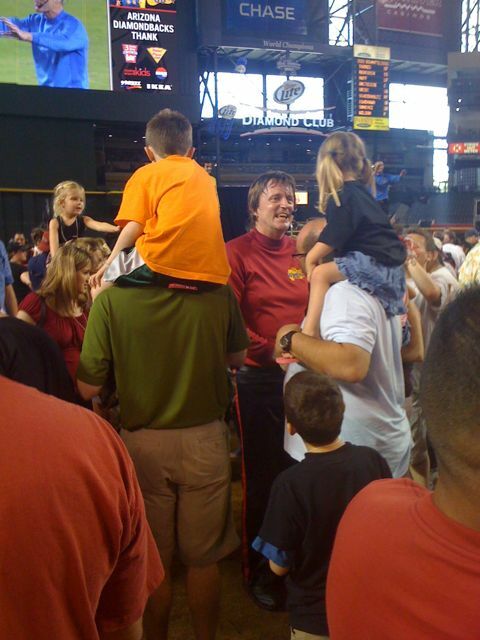 Lydia (on Dad's shoulders) meeting Murray. They sang a number of songs, and interacted well with the crowd. They did their best to move around the stadium to visit everyone who was in the stands as well as those who were on the field. Captain FeatherSword was always a favorite of Nate's and he was funny as always. At one point he did a headstand on the stage! 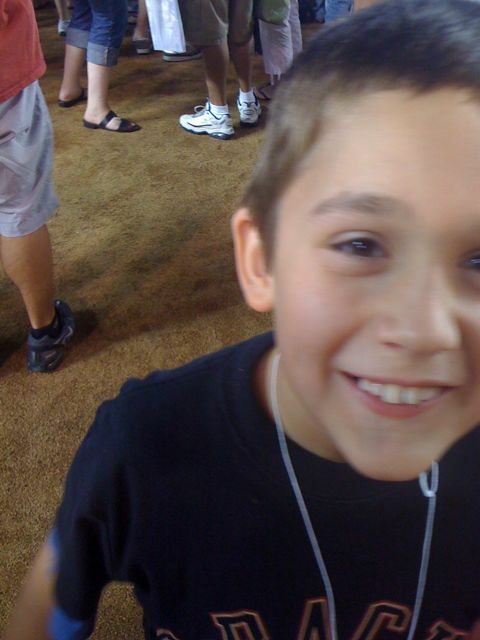 Anthony was always my favorite. 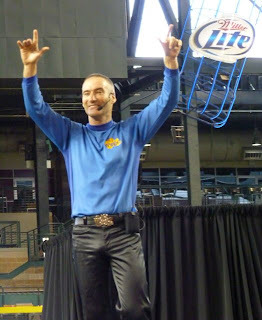 One of the best things about the Wiggles is the fun movements that go along with their songs. It's never very complicated, so it's easy to pick up and dance along with them. The moves haven't changed in 8 years, so we danced and sang along throughout the concert. We had an amazing afternoon! The boys started it with some batting cage practice, then we all watched a good baseball game, finishing it up with The Wiggles. Lydia wanted to know if she could see them again today, but I had to break it to her that we'd have to stick with DVDs and catching them on Sprout until they came back to Phoenix. If you'd like to see the Wiggles perform, their U.S. tour schedule can be found here. Thanks to Sprout TV we are waiting for the Wiggles to take the field! 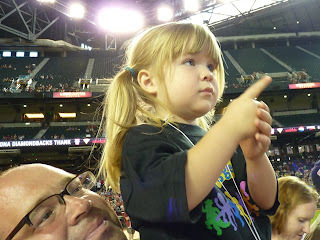 It's been a good Diamondbacks game so far (tied 2-2 at the top of the 7th) but Lydia wants to sing along with the Wiggles! I traveled for work last week again, and since I'm not sick with pneumonia like the last trip, it was better from the start. I found out that TSA considers maxi dresses a potential security threat, so I was pulled aside for an inspection for the first time ever. I'll reconsider my traveling outfit next time! I also few Southwest Air for the first time. I did pay the extra $20 out of my own pocket for the early boarding opportunity, which got me in the "A" boarding group both ways. I am glad that I did, as I was able to choose my seat in an empty row and not have to worry about where to stow my carry-on. Other than the uncertainty about boarding and finding a seat, it wasn't different from any other airline I've flown in the past. 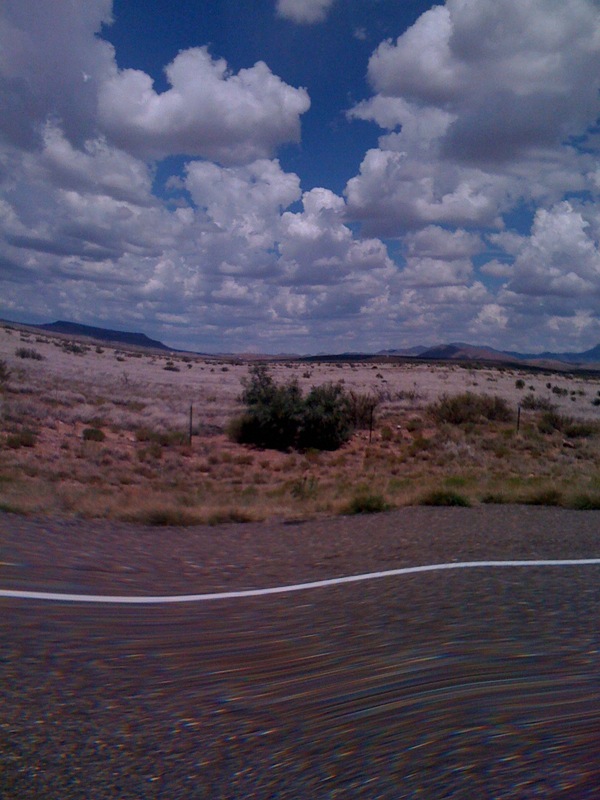 I flew into El Paso and then rented a car to drive about 3 hours to be close to the client. 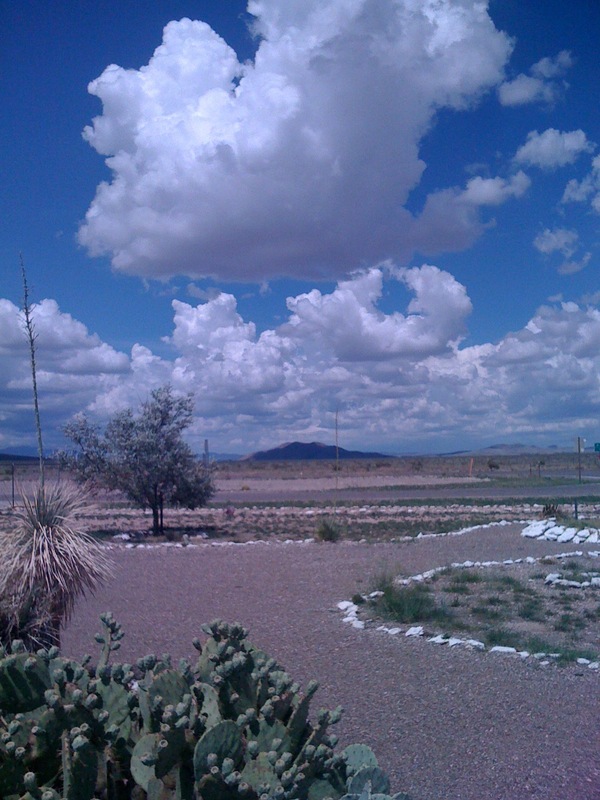 When I picked up my car, they told me that El Paso was expecting hail, but I should miss it. Instead, I crossed the border into New Mexico into a thunderstorm. It stormed the majority of the drive, but there wasn't much traffic and it was kinda neat to watch all the lightning strikes. If I had a little more time, I would have liked to visit a couple of the state parks that were close, but this trip didn't leave time for that. The training went well, and my students seemed happy to learn a new piece of software. They were a very nice group of people, and I enjoyed my 2 days with them. It was quiet in the hotel at night, though, since it was just me. I will admit that I enjoyed it. I turned in early my 2nd night there since I knew I had a long day the next day, since I planned to travel home after class ended. 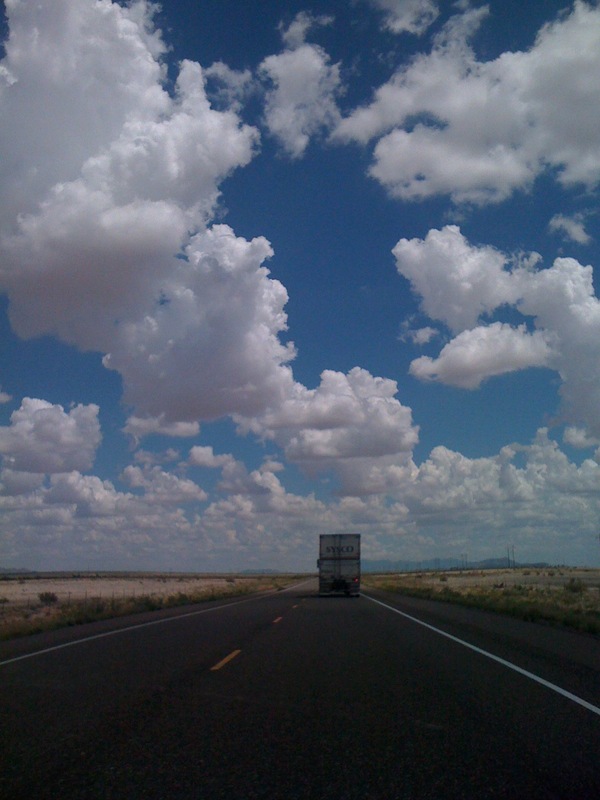 My drive back to El Paso was thunderstorm-free, and I got some great shots of clouds from the car during my drive. I missed my iPod adapter, though, because the choices in radio stations wasn't that great. Everyone at home survived just fine. The hardest part was when I would call home and talk to Lydia, she would be chipper and happy, until she thought I was going to say good-bye. Then she'd get a catch in her voice and say "Do NOT say BYE yet. I'm still talking!!" Then, I'd get a catch in my voice and continue talking to her. Thankfully, my sister is here and able to help out in the evenings when Bo needed to run a late call. We were running errands yesterday with my sis and we were talking about Texas. Lydia said that my sister did NOT want to go there because my other work was there. We figured out that she meant that we both couldn't be gone and she was afraid that if Jane went to Texas and I went back to Texas for work, Jane wouldn't be here to help care for them. Bo spent about 15 hours on Saturday putting in a new air conditioning unit for my parents' rental property, and is back there again this morning. He'll be home in a few though as we have plans to attend the Diamondbacks game (and Wiggles concert) this afternoon. I'm glad to be home, but I'm also interested to see where work will take me next! 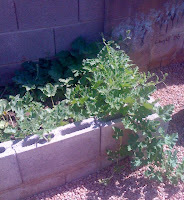 Last week, I showed you our very happy watermelon plants. 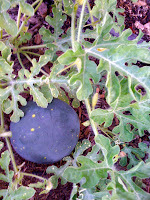 There were no melons then, but there are this week! We have about six that are bigger than my fist. This is from our heirloom "Moons & Stars" plant. I love the unique design on the rind. I can't wait to see how they taste! Last week, I received a gift card from Wendy's to try out their new salads. I tucked into my wallet and am so glad I did! It was delicious! Fresh, delicious ingredients and it was the perfect dinner after a long day of travel. I've always liked their salads, and I'm glad to see they've added some new ones to the menu. Thanks, Wendy's for the gift card! 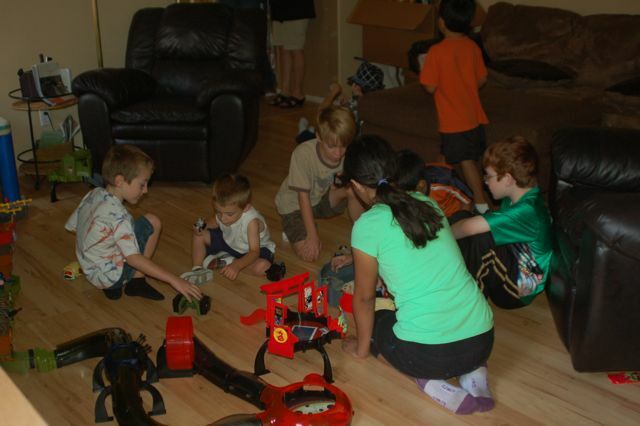 For the past few years, the boys attended an enrichment program one day a week. The program offered hot lunch, and the boys often chose to purchase lunch on the days they went. When we signed up for Open Gym, they had to bring their lunch each day. We had a couple older lunch boxes, but I wanted something different. I had seen bento-style boxes, and the more I looked at different choices, the more I liked the Goodbyn . The boys each chose their color (Lydia did, too -- she has a purple one ) and we waited for them to arrive. The boxes came with a huge roll of stickers for decoration. I admit that I was leery about the stickers -- how long would they last? The picture above was taken at the end of 6 weeks of constant use and not one sticker came unglued, even after daily washing. They are dishwasher-safe, but I always rinsed ours out and let them dry in the dish drainer. Each child had a great time personalizing and decorating their boxes with the stickers included. They decorated both outside and inside of the lid, as well as the bottom. A 8.5 oz plastic bottle (in the same color as the box) is included. I filled these about 3/4 with water and froze them each night. When I packed them in their box in the morning, it helped keep their lunches cooler and they had cold water to drink by lunchtime. Again, I was worried about leaks. They are designed so well that we never experienced one leak! I read some reviews that the tops were difficult to seal properly, but neither I nor the boys had any trouble sealing the lids on ours. We started in the middle, as suggested at their website, and then moved outwards to the edges. It was easier to seal than some Tupperware I have. Another advantage? They're completely recyclable when you're done using them! Oh! And they are completely BPA-free and contain none of those nasty phthalates or lead or anything that might be dangerous. AND they are made in the USA! My only wish? Silverware options that fit in easily. I am sure there are some out there, I just need to do more looking. 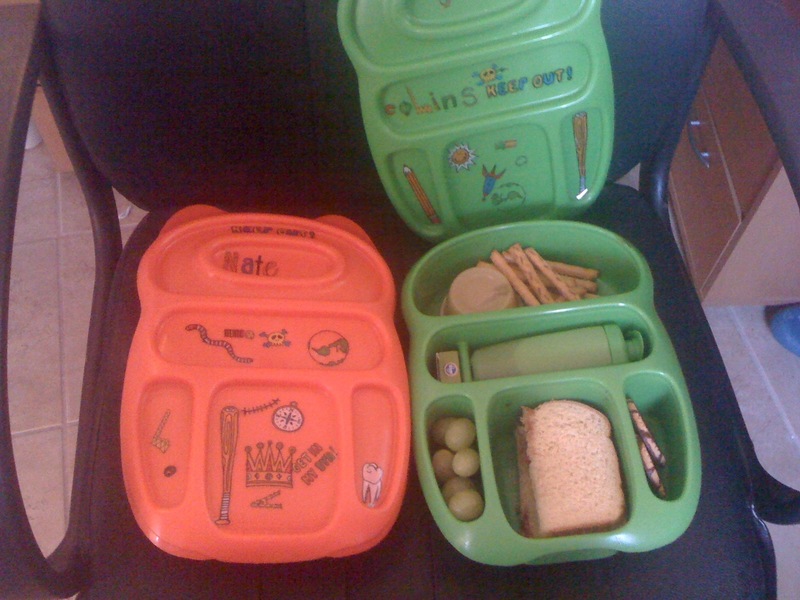 The boys start school in a couple weeks, and will continue using these boxes when they don't choose hot lunch. At less than $25, I think they are a great deal! (Yes, more than a traditional lunchbox -- but you don't need any separate containers or bags, which will equal tremendous savings over a school year.) You can purchase Goodbyns from Amazon , the Goodbyn website, or some retailers. I just finished up teaching a class, and opened my email to find a few messages from readers in the Detroit area. Hello, Detroit!! Apparently, the Fox News clip I did a few months ago appeared on the Detroit affiliate today. I think that's so fun! After that clip aired in Phoenix, I wrote up a post about the products shown. Please click through and check it out! I also just want to say Welcome! I always love new readers, and look forward to getting to know you. Feel free to comment or email me directly. Late last week, we came home to a box on our doorstep. Colin carried it in for me, and we all eagerly opened it up. It was from ProFlowers and packaged very well! There were clear arrows letting us know which end was up, and directions how to split the box in 2 and remove the top. Inside we found a money tree. I love the braiding of the stems, and thought the legend was a neat one. A destitute man began growing these plants and selling them and was able to fare very well as a result. It's also a common feng shui feature in homes as a prosperity feature. 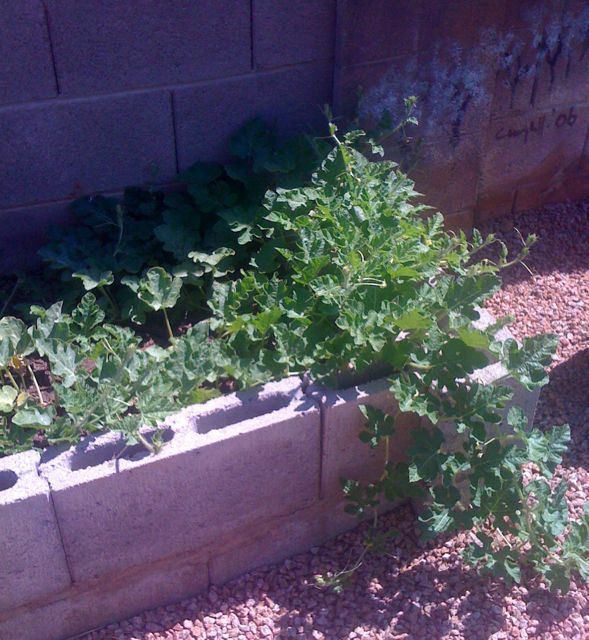 The plant was in perfect condition, and wasn't even wilted from the hot Arizona temperatures. I placed it in the pot and gave it some water. It's been very happy on the shelves in our office ever since. I figure since that's the place where Bo & I work hard on earning money for our family, it would be the perfect place for it. I have ordered from ProFlowers in the past and always been happy with their service and their products. On Mother's Day this year, I sent my mom 100 tulips from their site and she was thrilled. I also like giving plants as gifts because they tend to last longer than cut flowers. 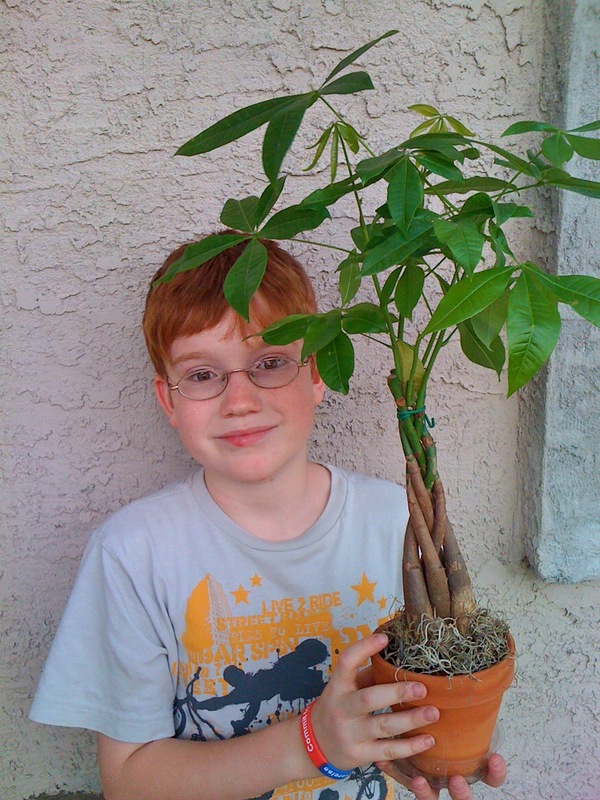 This money tree would make a great housewarming gift! Check out all the neat flowers and plants at www.ProFlowers.com. If you're looking for a unique and thoughtful gift, I'm sure they'll have something that interests you! A couple weeks ago, I received a box containing 2 packs of Solo cups and a bunch of other goodies -- stickers, sunflower seeds, garden signs, straws and more. My 3 kids thought it was the funniest box of things we've received in a while, but when I told them they could decorate the cups they got excited. I know we try to be green as much as possible, but sometimes disposable cups are easier. I like Solo cups because they are sturdy and can be easily washed and reused! They are also perfect for starting seedlings. We took a pack with us to a friend's house and the kids had a great time decorating the outside of the cups with markers and stickers. Their personalized cups were easy to spot all day long and we didn't go through as many cups as if they hadn't been able to easily keep track. Unfortunately, my pictures from that day were corrupted -- but if you have fun with Solo cups, you can enter their fun photo contest! Disclosure: I received product from Solo Cups and MomSelect. No further compensation was provided, and all words are my own. 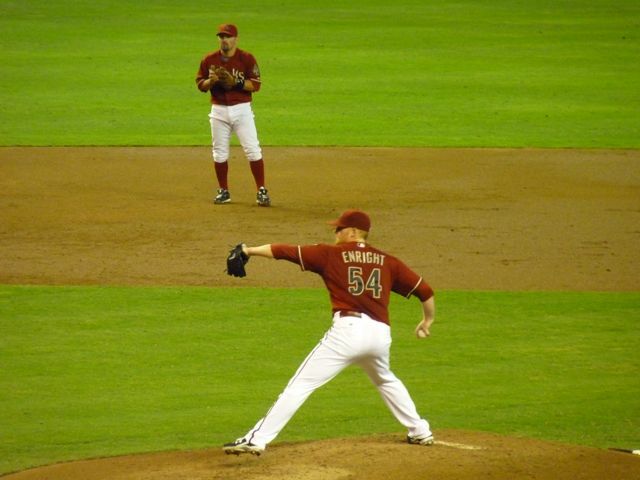 You may have heard that it's hot in Arizona. Well, it is. We eat many more ice cream treats during the hot summer months than the rest of the year. Breyer's recently came out with a new line of Smooth & Dreamy ice cream bars and sandwiches, and we were fortunate enough to have the chance to try some out. I picked up a box of Triple Chocolate Chip bars and they were delicious! I had every intention of taking a picture, but I was distracted by how good my bar tasted and before I knew it they were all gone. At 130 calories per bar, 6g of fat and no artificial colors or flavors, it's not even that decadent of a treat. But, I can tell you that it was very tasty! Would you like to try your own? I have 3 coupons to give away to my readers so they can taste the smooth, dreamy, icy yumminess for themselves at no cost! To enter this giveaway, follow this link to fill out the Giveaway Form with the correct info, and check out my giveaway rules if you're not sure what they are. This giveaway ends July 29, 2010! Mandatory Question: What kind of Smooth & Dreamy treat will you buy if you receive a coupon? You can check out the Breyer's website for fun games and contests, as well as product information and recipes. The boys had their last day of Open Gym on Friday. Six weeks ago they were dreading the experience, but they finished up on a positive note and had a wonderful time after the first week and half. I'm proud that they both stepped up and made the best of the situation and didn't dwell on how uncomfortable they were during the first days but embraced the opportunities they had. I'm also proud that I encouraged them to stick with it and I didn't cave after the first week and pull them from the program when they were struggling. I knew it would be a good experience in the long run, and I knew they would grow and learn things about themselves. I'm frustrated by parents who never let their kids persevere through challenges and continually make things "easier" rather than helping them learn how to approach and conquer difficult situations. Last week I headed over to the school district office and enrolled the boys in our local public school. I have talked about it, and we had made our decision . . . but until last week I hadn't made that final step. I first headed over to their school, but found out they were closed for summer vacation. The sign indicated that the district office was open for registrations, so I made the 20 minute drive to get it done. I had a free morning, and didn't want to wait any longer. The process was simple -- I provided some information, filled out a couple forms, and the boys were enrolled. Then, I went out to the car and cried a little. I know we are making the right decision for this time in our lives, but it's still tough to give up our homeschooling days. Their first day is in 3 weeks. The weekend before school starts they are taking a trip with Bo to Milwaukee, then they come home in time for "Meet the Teacher" and school starts the next day. It'll be different, but they know that it will take a few weeks to adjust and we're trying to ensure that they won't have many new things to deal with during that time. I did sign Nate and Lydia up for fall baseball. Colin is too old this year, but we've been part of fall ball for the last 5 years, so I think it would feel funny if we didn't play ball. This is Lydia's first year, and her season only lasts 4 weeks, while Nate's will last 6 weeks. It feels like summer has flown by. I've been working quite a bit, and will continue to do so. I'm glad we got so many fun trips into the summer, and we're already trying to think of where we'll go this fall. The summer may have flown by, but it's been jam-packed. 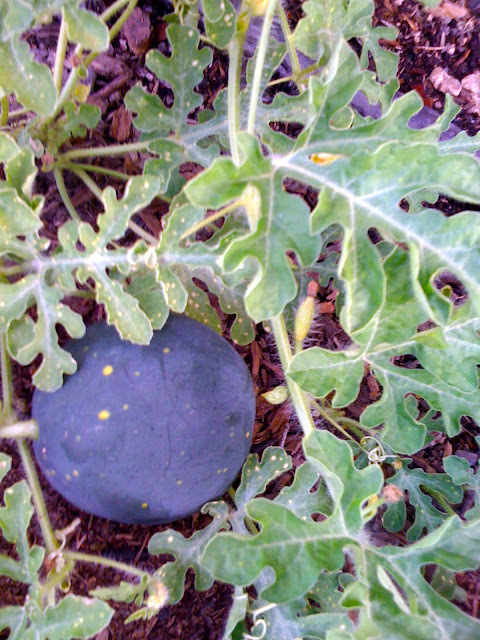 This quickly growing plant started as a few seeds from a watermelon we ate. The kids picked out the seeds after dinner and planted them in this box. These seeds are growing better than anything else I planted! So much for all the heirloom plants and heirloom seed packets . . . these grocery store watermelon seeds look like they're going to give us plenty of melons to enjoy in August. I was very intrigued by the Pocket Purifier when I saw it and was eager to try it out. The Pocket Purifier is a UV light, similar to the ones that are used in hospital settings to disinfect things. The idea is that you turn it on, shine it on an area for 10 -15 seconds, and most of the germs are killed. We've been traveling as a family, and I'm traveling more for work, so I was especially pleased that it is compact. It's light as well, and fits easily into a carry-on bag or even my purse. I have used it in a few bathrooms that seemed questionable, and the boys have used it around the house. I also threw it in my work bag and have used it to disinfect keyboards in the morning before class. It's important to note that there is a warning that the light should not be shined on skin or in eyes. This hand-held germ eliminating light can be purchased from Purely Products. They have offered a special 25% discount for all my readers for any orders placed before August 5, 2010 (offer not good on replacement UV bulbs.) Just follow the link above to receive your discount. We also had the chance to play with the SunMate. This product gives you a clear indicator of how strong the UV rays are at any point during the day with a set of lights. Both boys took the SunMate outside and tested it at various times during the day. Their guesses about what times would have the strongest UV rays were usually right on target. It helped when I said "No, let's swim later" when they could use this tool to check the rays and realize Mom was right. Disclosure: This is a Mama Buzz review. The products were provided by Purely Products for this review. I have a ridiculous amount of music on my iPod . I have my music, plus the kids' music, plus podcasts and audiobooks. I recently had to take some music off to make room for new music, which had me in a discussion about what I am listening to these days. Black Eyed Peas, The E.N.D. - This album is a great morning commute album and helps get me ready to face the day! Sting, Symphonicities - This one was released this week. It has no new songs, just old songs re-worked with a symphony and his vocals, but I adore Sting and love this album just like I love them all. I have listened to Sting for so long, that almost every one of his albums marks some point in my life and evokes memories. Listening to this compilation is like going through an old photo album in a way. Jewel, Sweet & Wild - Another recent addition. I like the sound of her voice, and listening to her reminds me of the time in my life when I first started listening to her and all that was happening. Sweet times connected to a sweet voice. Joan Jett & The Black Hearts Greatest Hits - Another walk down memory lane with this one! My sister was 3 when "I Love Rock & Roll " was a big hit and I remember teaching her the lyrics and how she would dance and play air guitar on my bed whenever it came on the radio. Nate likes this one, too, but Colin wishes we'd learn to turn down the volume. Putumayo Kids Picnic Playground - Lydia absolutely loves the Ice Cream song on this album, as well as Bowl of Cherries. 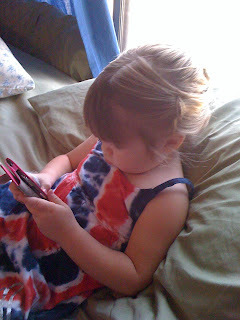 She asks for the Ice Cream song every time she sees my iPod (doesn't seem to matter that I loaded it on hers . .. it apparently sounds better coming from mine.) The greatest thing about these albums is that all my kids enjoy them, and so do I. Every one we've ever listened to has amazing musical choices. Putumayo Kids Rock and Roll - The latest Putumayo Kids release, and just as fun as all the ones that came before. We've just started playing it in heavy rotation, so I'm not sure what favorites will come out, but I am sure there will be one or two. Pancho Sanchez, Raise Your Hand - I think I've wrote about Nate's love of jazz before, and Sanchez is still one of his favorites. I especially like the song "Raise Your Hand" and Nate & I like singing loud to this one. That's a brief look at my playlist -- what's on yours? What music is moving you these days? I'd love to know!